A lot of markets are at crucial areas here. The US major indices are probably going to decide which direction longer term they want to go. They could continue range bound for awhile longer though unless the Patriots get a hold of the air in the futures markets. They are at the top of the trading range here. You can especially see this in the Nasdaq. I was going through some scans and medical stocks kept showing up in large numbers. Biotech is one of the hot industries right now. 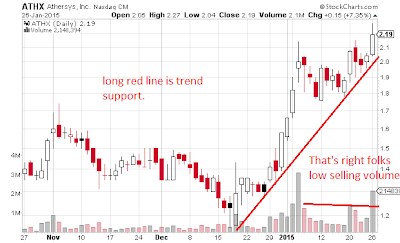 So, I am putting up some of the best biotech charts I found. If the Biotech ETF IBB is not good enough for you these are some potential trade ideas. These are all momentum stocks in bull flags or breakout plays. 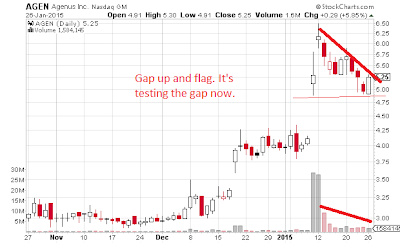 This is purely from a technical analysis standpoint. SCMP that I put up a couple days ago was pretty cool because it was nice technically and with fundamentals. It's breaking out again up 6% yesterday. 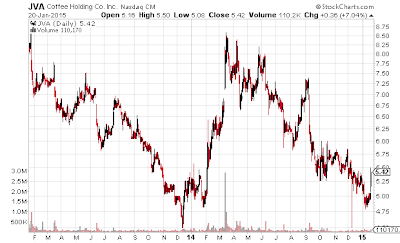 I don't know what is up with the value stock JVA technically. It has some crazy prints the past couple days. It looks like it could be going a lot lower now. Well, good for us value investors. As I'm typing this it is very early Tuesday morning the 27th. Let's get to the list. 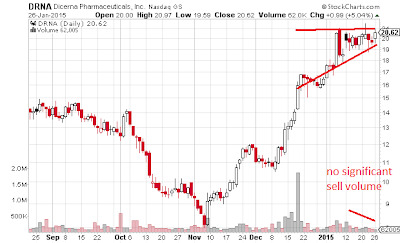 First we have Dicerna Pharmaceuticals (DRNA) which has formed a triangle consolidation on light sell volume. Well formed triangles are one of the most reliable patterns. If it breaks out there should be a lot more on the long side but also if it breaks down from the triangle there will likely be more downside. Long bias on this one though but we shall see. 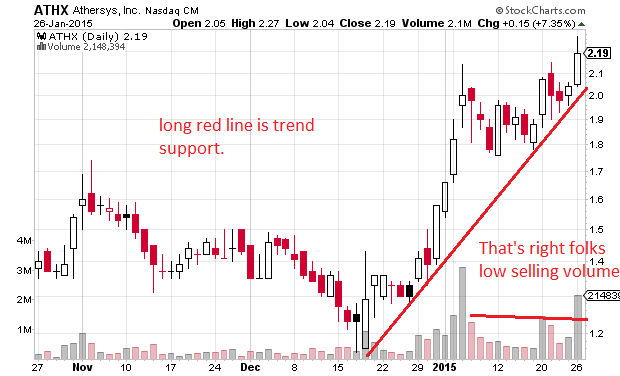 Next we have Athersys (ATHX) This one just broke out off of trend support. It did a hammer first on trend support and is running again. 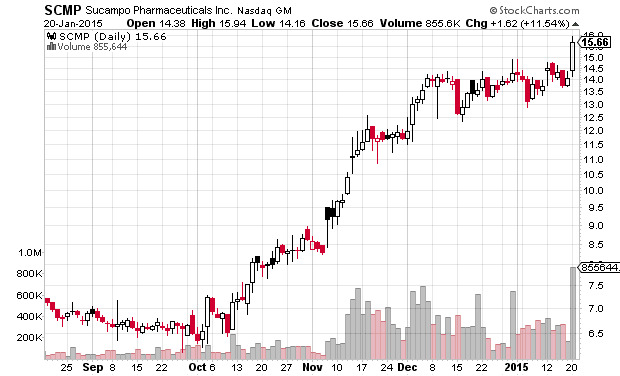 We have ZIOPHARM Oncology, Inc. (ZIOP) next. 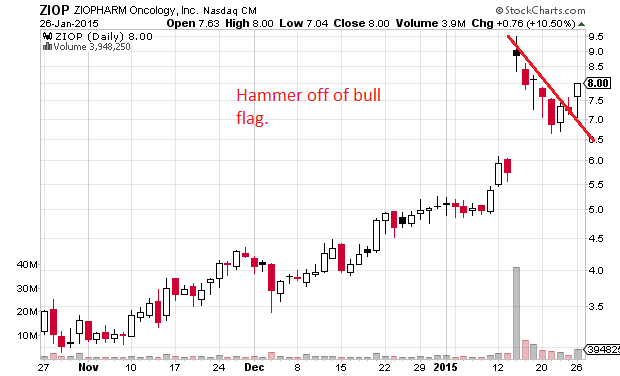 This is a cool one because it gapped up, consolidated into a bull flag and is coming off the flag with a hammer. Last is (Agenus AGEN) which is very similar to ZIOP. 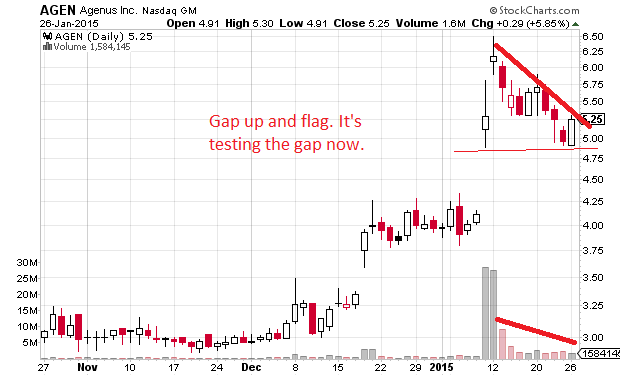 We have a gap up on very strong volume, a flag on light volume and we are testing the gap now. I went through some scans I typically go through and thought I'd post some that caught my eye. The first one bottom up is Sucampo Pharmaceuticals SCMP. 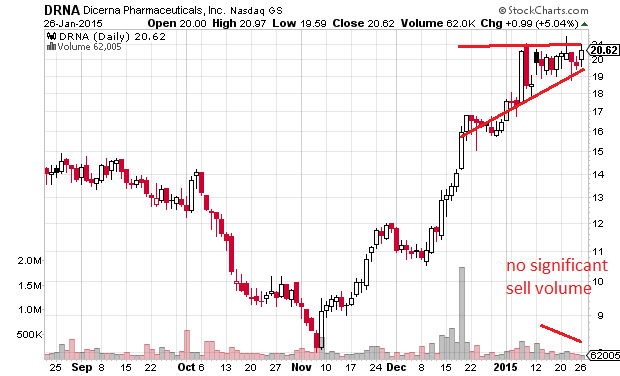 The chart was cool because it just broke out of consolidation on very strong volume. It's also at a 5 year high. I looked at it some more and this is just under a $700 million dollar company with a diverse portfolio of pharmaceuticals it sells. The good thing I see here is the earnings revisions. Next quarters earnings estimate is $.11 up from $.05 90 days ago. The current years estimate is $.47 a share up from $.22 ninety days ago. Next years EPS is currently $.60 up from $.40 ninety days ago. It's always great when earnings are revised up. With the stock at $15.66 this gives us a forward P/E multiple of 26. With earnings growing about the same rate the stock is conservatively fairly valued. However, the next 5 years are expected to grow more giving the stock a mere .35 PEG multiple(price to earnings growth). Lots of bullish stuff going on here. I found this coffee company called Coffee Holding Company ticker JVA. It is a small company with a mere $34 million dollar market cap. Coffee companies are usually good businesses especially if you are selling beans wholesale, which they are. They are profitable and I see no reason the stock should trade around net tangible asset value. Roughly $20 million is net tangible asset value and the market cap is just above it at $34. It's around technical support and just had a wide ranging day up 7%.